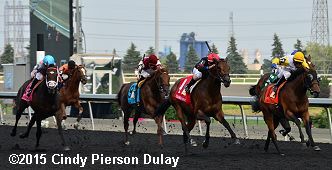 On Sunday afternoon, a field of 13 Canadian-foaled 3-year-olds raced 1 1/4 miles over the Polytrack at Woodbine in the 156th running of the $1 million Queen's Plate Stakes, the oldest continuously-run stakes race in North America and the first leg of the Canadian Triple Crown. Conditions were excellent for early July in Toronto, with partly cloudy skies and temperatures in the high 70's. 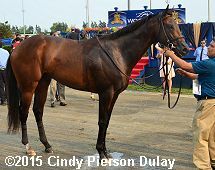 Danish Dynaformer was sent off as the lukewarm 3-1 favorite off his win in the Plate Trial after finishing third in the Marine (G3), both at Woodbine. 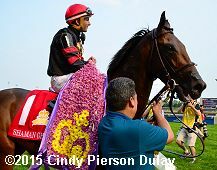 In to challenge him included 7-2 second choice Shaman Ghost off a three-race win streak including the Marine and allowance races at Gulfstream and Keeneland, and 9-2 third choice Ami's Flatter, second in the Tampa Bay Derby (G2) before third in the Florida Derby (G1) and 7th in the Marine. Down the stretch with Shaman Ghost closing down the center and Danish Dynaformer leading. 11-2 fourth choice Academic was quickest away and got the opening quarter in 22.99 before 46-1 Sweet Grass Creek took over on the far turn and sprinted away to a 4 1/2 length lead through a half in 45.76 and 3/4 in 1:10.82. On the far turn, both Academic and Sweet Grass Creek tired badly and were distanced at the finish. 15-1 Billy's Star, 11th early, came out for room to gain the lead at the top of the lane through 1 mile in 1:37.54 and held the lead past the 3/16. Danish Dynaformer, 10th early, came through late to gain a short lead inside the 1/8 pole, but Shaman Ghost, 7th early, came out widest of all to win going away by 1 1/4 lengths in 2:03.45. It was just 1/2 a length back to late-running Conquest Boogaloo third. Left: Shaman Ghost heads to the winner's circle. Winning trainer Brian Lynch said, "It's a prestigious race. 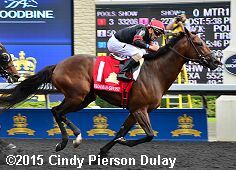 Certainly my first Queen's Plate (win). I've been beaten a nose in it before. But to win it for the Stronachs, it's great. I thought it was a great ride, very patient. I thought a few jocks panicked at the 1/4 pole, but you can see him sort of sitting. We had the best horse on the day. I could just see Rafael's red cap moving forward, trying to get himself in a good position. Then I knew this horse would have some finish to him and I knew I had the right rider. He is very patient and would give this horse a fabulous ride." 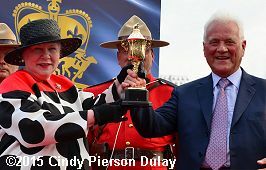 Right: The Honourable Elizabeth Dowdeswell, Lieutenant Governor of Ontario presents the Queen's Plate trophy to winning owner Frank Stronach. Left: Shaman Ghost parades for the fans after the race. Winning jockey Rafael Hernandez said, "I just wanted to make sure, me and Brian where talking about it, just by the 1/4 pole try to be outside the horses. He (Danish Dynaformer) make a move too early, I let him pass me. I know my horse always got a kick. So he did his thing. He made his kick down the lane and we get them back. Brian said he had been training well. Been training very good because he won this race. He is a great horse. He gave me everything today." 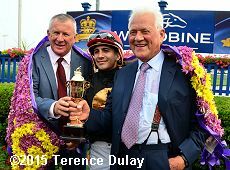 Right: Trainer Bryan Lynch, jockey Rafael Hernandez, and owner-breeder Frank Stronach pose with the trophy and flower blanket. Left: Shaman Ghost gets hosed off after the race. 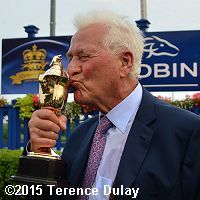 Winning owner-breeder Frank Stronach said, "Just as I was walking in the grass near the saddling area I looked down and saw a four-leaf clover. That's usually a good sign. But I had a good feeling all day long because the horse here beat every horse in the race before in better times. 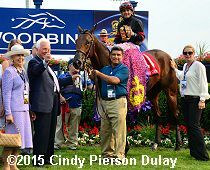 I think this time we got a real good horse and he was hardly breathing when he came over here (to the winner's circle)." 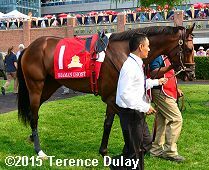 Right: Shaman Ghost in the paddock before the race. Left: Second place finisher Danish Dynaformer returns after the race. 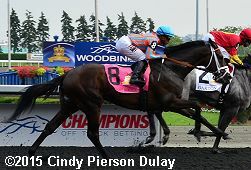 Trainer Roger Attfield, who also trains 4th place finisher Billy's Star said, "They were both excellent, but they got beat by the horse I was worried about. They both ran well, there's no question." Right: Third place finisher Conquest Boogaloo trails first time by. 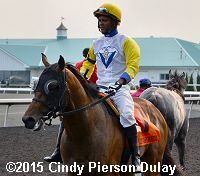 Jockey Alan Garcia said, "He broke a little slow and it took me out of the race. I had to check early and lost a lot of momentum then." 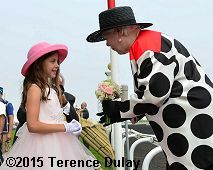 Left: The Honourable Elizabeth Dowdeswell, Lieutenant Governor of Ontario was the Royal Representative at this year's Queen's Plate. She arrived in the Royal Landau, a Queen's Plate tradition since King George VI's visit in 1939. 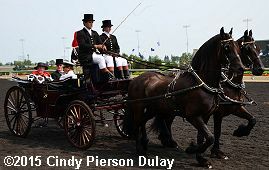 The landau was escorted by the Toronto Police Service Mounted Unit and the Governor General's Horse guards Cavalry Squadron. Right: After exiting the landau, she was first welcomed to Woodbine by president and CEO James Lawson, and was handed a bouquet by flower girl Sabrina Siscos. Lawson then escorted Her Honour across the turf course and up the steps to the Royal Box on the second floor clubhouse.